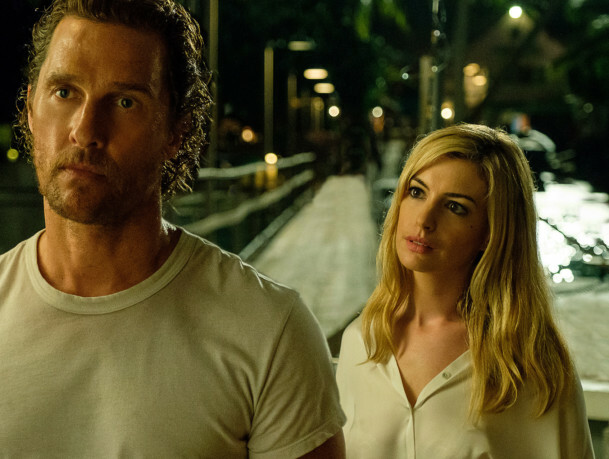 Matthew McConaughey and Anne Hathaway notched one of the worst debuts of his career, Oscar nominees saw only modest bumps and M Night Shyamalan’s ‘Glass’ easily remained No 1 on a quiet weekend in movie theatres. The weekend’s two new wide releases — McConaughey’s tropic noir ‘Serenity’ and the updated King Arthur tale ‘The Kid Who Would Be King’ — both flopped with moviegoers who instead continued to flock to ‘Glass’ and Kevin Hart’s ‘The Upside’. Shyamalan’s sequel to ‘Unbreakable’ and ‘Split’ sold $19 million (Dh69.78 million) in tickets according to estimates Sunday, a decent 53 per cent drop from its opening weekend. In 10 days of release, Shyamalan’s self-financed thriller has made $73.6 million domestically and $162.7 million globally. ‘The Upside’, starring Hart and Bryan Cranston, also stayed lodged in second place with $12.2 million in its third weekend. The weekend’s biggest budget new entry, ‘The Kid Who Would Be King’, opened poorly with $7.3 million against a $59 million budget. The 20th Century Fox release, produced by Working Title, was written and directed by ‘Attack the Block’ filmmaker Joe Cornish. In his modern-day London version of the legend, a working-class boy pulls Excalibur from a stone. Though ‘The Kid Who Would Be King’ drew good reviews (86 per cent fresh on Rotten Tomatoes) and was largely pleasing to audiences (who gave it a B-plus CinemaScore), Cornish’s film came in on the low side of already undersized expectations. Smaller still was ‘Serenity’, from the recently launched distributor Aviron Pictures. Though boasting a respected writer-director (Steven Knight, the creator of ‘Peaky Blinders’ and maker of 2013’s ‘Locke’) and a starry cast including Anne Hathaway and Jason Clarke, ‘Serenity’ made only a minor disturbance at the box office with $4.8 million in ticket sales. The film, about a fishing boat captain on a mysterious island, was lambasted by critics (21 per cent fresh on Rotten Tomatoes) and audiences agreed, giving it a D-plus CinemaScore. The film, made for about $25 million, is among McConaughey’s weakest performing wide-release debuts, behind only 2017’s ‘Gold’ and 1996’s ‘Larger Than Life’. For Hathaway, it’s a new low.